One hundred and fifty miles off the Horn of Africa lies a tiny archipelago of islands known as Socotra. Because of its extreme isolation from other land masses, Socotra has very unique plant life, a third of which can be found nowhere else in the world. 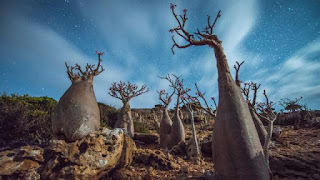 Not only are the plant endemic to Socotra, but they look weird as can be, causing people to refer to it as "the most alien-looking place on earth." Socotra is part of Yemen, which is currently undergoing some serious political strife. But you wouldn't know that from the surreal beauty of Socotra.